SOME BEACHES ACROSS Ireland were left in dire conditions after the warm weather this weekend. One Cork photographer captured photos of rubbish left on a local beach this morning. 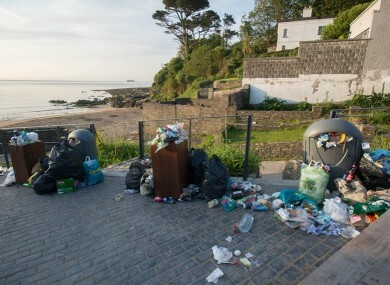 Images taken by Howard Crowdy of Myrtleville beach, 20km south of Cobh, Cork, show bins overflowing with rubbish, with items scattered along the walkways and sand. Broken bottles, dirty nappies, discarded shoes, towels and backpacks were left behind by beachgoers. Temperatures hit 26 degrees in some parts of Ireland over the weekend and the warm weather saw thousands take to beaches along the coasts to soak in the sun. The scenes at Myrtleville beach this morning mirror the state of many beaches across Ireland after this weekend. “They wouldn’t like a visitor to come to their front room and leave their rubbish behind and walk away, so why did they treat a public space in that manner?,” O’Cadhla said. According to O’Cadhla, the issue was address at a Cork County Council meeting this morning, but no significant resolution was found. An Taisce’s Clean Coast organisation said that over 15 tons of marine litter was cleaned off Irish beaches at the start of June during the Coca-Cola Clean Coasts week, which encourages beach clean-ups. “Seeing this destruction of stuck a stunning beach is terribly saddening especially as it follow a week where Clean Coasts programme engaged over 2300 volunteers helping to clean up their local beaches,” Sinead McCoy, Coastal Communities Manager at Clean Coasts said. Email “Irish beaches left covered in rubbish after thousands soaked up the sun ”. Feedback on “Irish beaches left covered in rubbish after thousands soaked up the sun ”.